Firstly, I have to say that the packaging is beautiful. 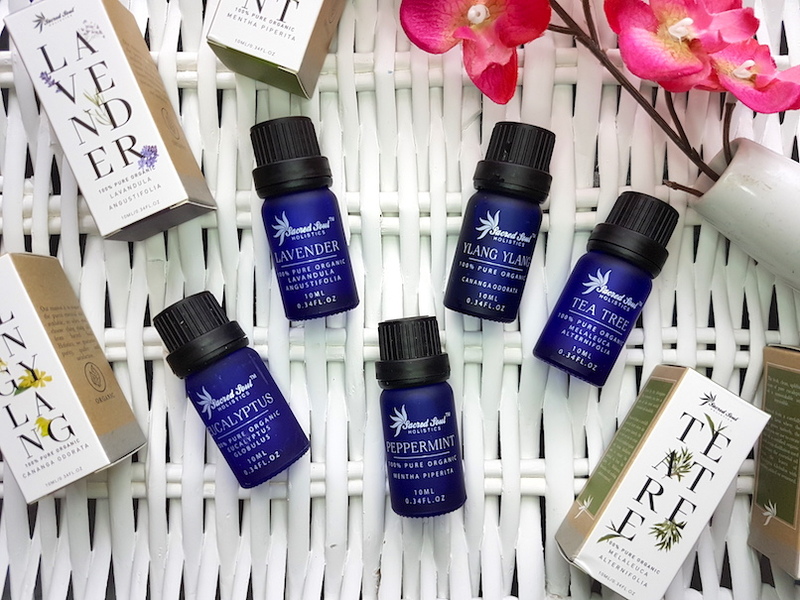 Each of the oils comes in small, dark blue, glass bottles (dark blue or dark orange/brown bottles helps to prevent the product from spoiling due to ultraviolet degradation) and come with screw cap lids. 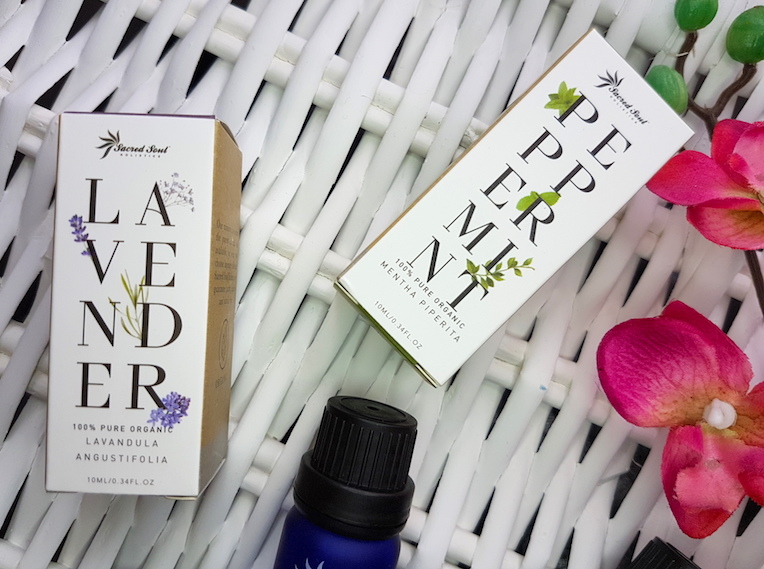 These bottles then come packaged in these very pretty boxes that tell us what is inside, but also have illustrations of the plants from which the oils originate. 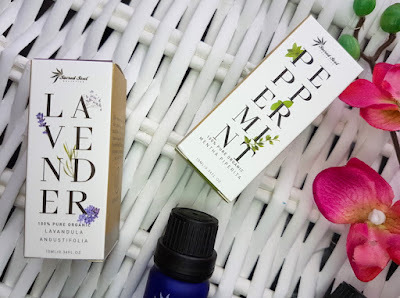 I've found these oils to be of great quality and this is also shown in how well they work. Whatever I've been using them in I've had some fab results. The best way that I can really review the oils for you is to discuss how I’ve been using them, and this also allows me to give you some ideas of how to use the oils yourself. With the Lavender oil I have added a couple of drops to water when rinsing my daughter when she is having an eczema flare up. I found that it helps somewhat in conjunction with her creams, and it also leaves a beautiful relaxing scent so it helps with the nighttime routine as well. It is also good when used in conjunction with oils such as Tea Tree and Coconut to create a blend that can help battle things such as perioral dermatitis (mine has flared up AGAIN, so this is the exact mix that I’ve been using to help to clear it). I've been using the Tea Tree oil on my hair when mixed with water or green tea to help with an itchy, sensitive scalp. I've found that it's been helping but it is also a little early to say how well it's helping in the long run yet. However, I have also been using the Tea Tree on my skin for blemishes (and as I mentioned a moment ago, for perioral dermatitis), and it has been really helping. It’s also great on post-blemish marks and adding some to the water that you use to rinse your face can help too. Ylang-Ylang oil is particularly great in the bath. Just adding a couple of drops is really relaxing and helps to calm the mind as well as lightly scent the skin post-bath. I’ve been particularly enjoying that at the end of a long day! Another great use for Ylang-Ylang is in the hair. You’ve probably seen numerous shampoos that claim to contain Ylang-Ylang, and that is because it has so many great benefits for the hair. For example, Ylang-Ylang essential oil can help to stimulate hair growth, or it can help to condition the hair. Adding some in a rinse or with a carrier oil to use as a scalp or hair oil can really help your hair to shine. I’ve been adding some to the water I use to rinse my hair to create a final rinse and it has been leaving my hair looking soft and healthy as well as lightly scenting it. The Eucalyptus oil is fantastic for the cold and flu season. If you're suffering from a runny nose, burning some Eucalyptus oil in a carrier oil or in a small amount of water can really help to clear the nose. Along with Tea Tree, it's also fantastic for soothing an itchy scalp, which is how I’ve mainly been using it thus far. For the skin, it can be used on things such as spots or cuts, but can also be good on oily skin. Therefore, it can be good to add a couple of drops to the water you use to rinse your face after washing to help to keep oil under check, or add a couple of drops to your toner. I’ve found that using in in the water to wash my face has helped to prevent oil over-production. Peppermint oil is one of my favourite oils. 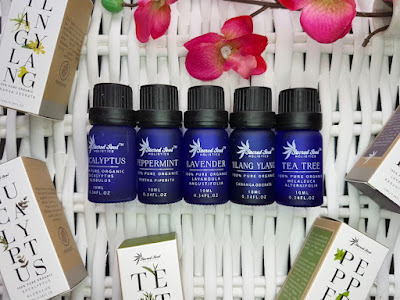 I've mentioned how sometimes I like to add a few drops of peppermint oil to things like toners in the summer or I like to make my own facial mist that can include peppermint oil. This is because it really helps to give a cooling sensation to the skin which is a great relief in the summer. That isn’t all it’s great for though. Peppermint oil can be used on the hair also to prevent dandruff, or it can be used on the face to help with oily skin. And of course, for a great non-beauty related use, peppermint oil can be used in water as a spider/bug repellent. It’s great at keeping ants away in particular, too! Obviously these aren’t the only uses for these oils, but for what I’ve used them all for so far I’ve been really impressed. It is true that when you have pure oils the results are better, and the success I’ve had with these has made them more than worth it. The price point is pretty average for good quality oils (even though price isn’t always the best indicator to what qualifies as a top quality oil), so they won’t break the bank. They are more expensive than the cheap oils that you can find, and that little extra is well worth it when you reap the benefits. Do I recommend checking these oils out? Absolutely. If the no-nonsense approach that these guys has hasn’t been enough to sway you to taking a look already, hopefully my recommendation will. You can purchase the range at Sacred Soul Holistics. 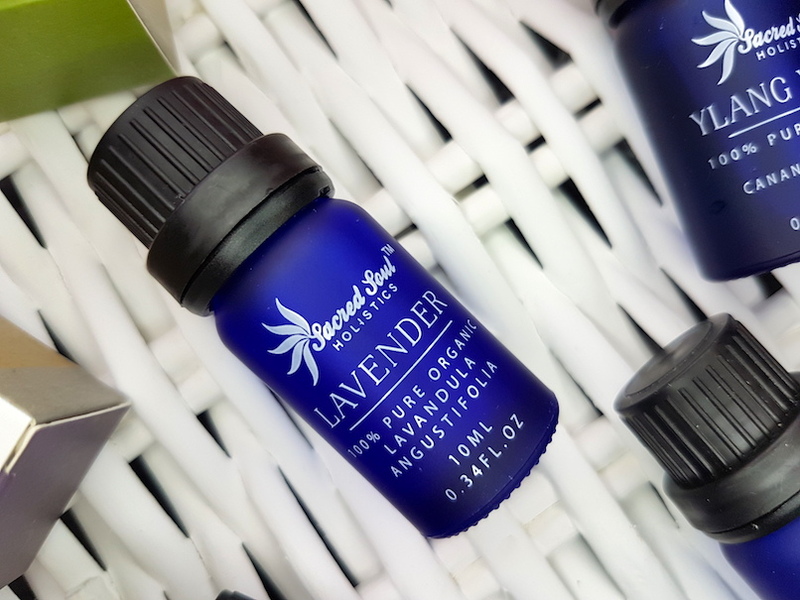 What are your thoughts on the Sacred Soul Holistics Essential Oils? How do you use essential oils?